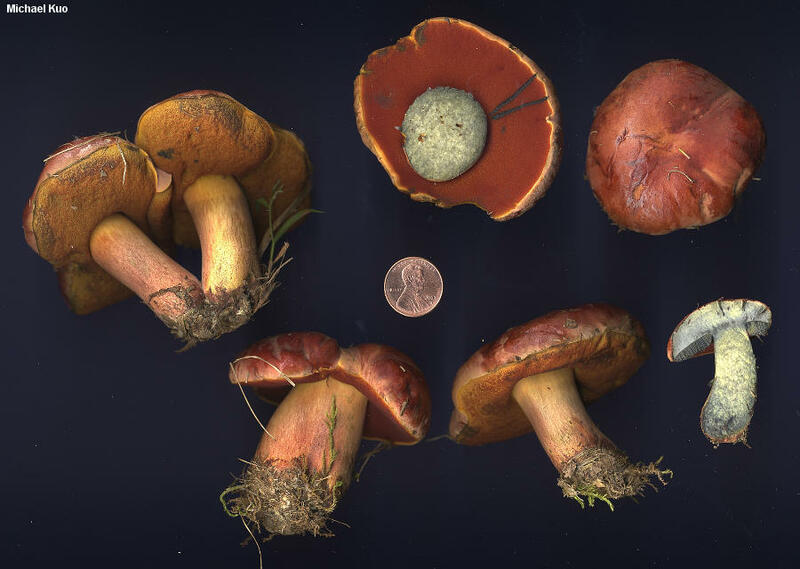 Here is a distinctive oak-loving bolete, characterized by its sticky, bright red cap; its blue-bruising, red pore surface; and its yellow stem, which is covered with tiny flecks of red. Although the cap dries out quickly, its former stickiness is usually still in evidence in the form of adhering leaves and debris, and a glossy sheen. 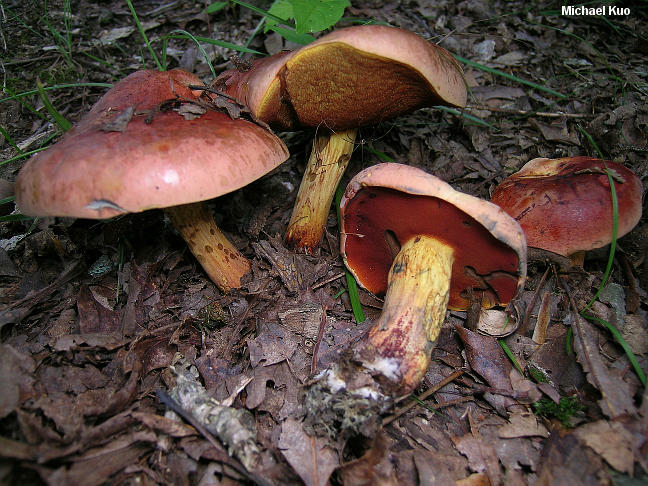 Rubroboletus dupainii is actually a European species, originally named from France. Over the last decade or so, North American collections have been identified in North Carolina and Iowa, and in Central America, in Belize. The collections illustrated and described here are from Illinois and Iowa. 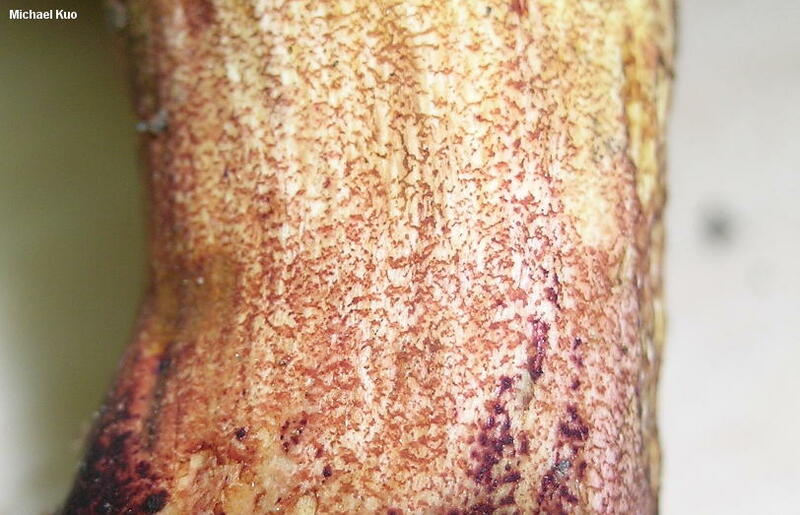 Whether or not the New World version of Rubroboletus dupainii is actually the same phylogenetic species as the original European species remains to be seen; DNA testing would be required. 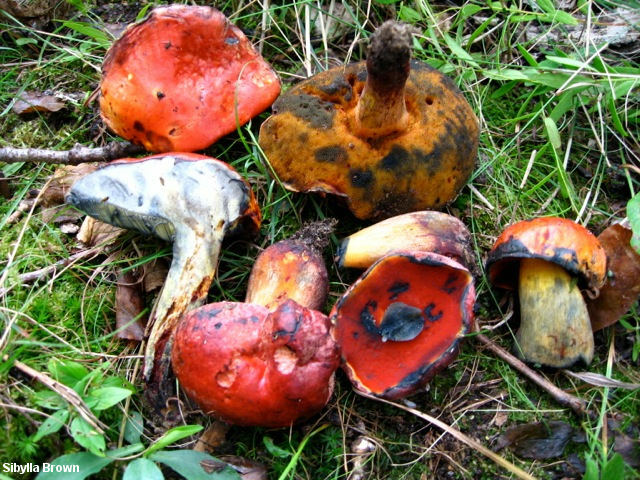 Boletus dupainii is a former name. "Suillellus dupainii" is a technically legitimate combination that should not be used because it was published irresponsibly, without peer review or scientific support. Ecology: Mycorrhizal with oaks; growing alone, scattered, or gregariously; early summer through fall; possibly widely distributed east of the Great Plains. The illustrated and described collections are from Illinois and Iowa. Cap: 4.5–10 cm across; convex, becoming broadly convex or nearly flat; sticky when fresh; bald; shiny when dry, and often covered with adhering leaves or debris; deep, bright red, fading somewhat with age; when very young with a dull pinkish bloom overall (later the bloom can sometimes be seen on the margin); when fresh bruising dark blue; staining waxed paper yellow. Pore Surface: Initially deep red to bright orangish red, with deep yellow marginal areas; becoming reddish orange, then orangish brown to olive; bruising promptly dark blue or nearly black; 3-4 round pores per mm; tubes to 1 cm deep. 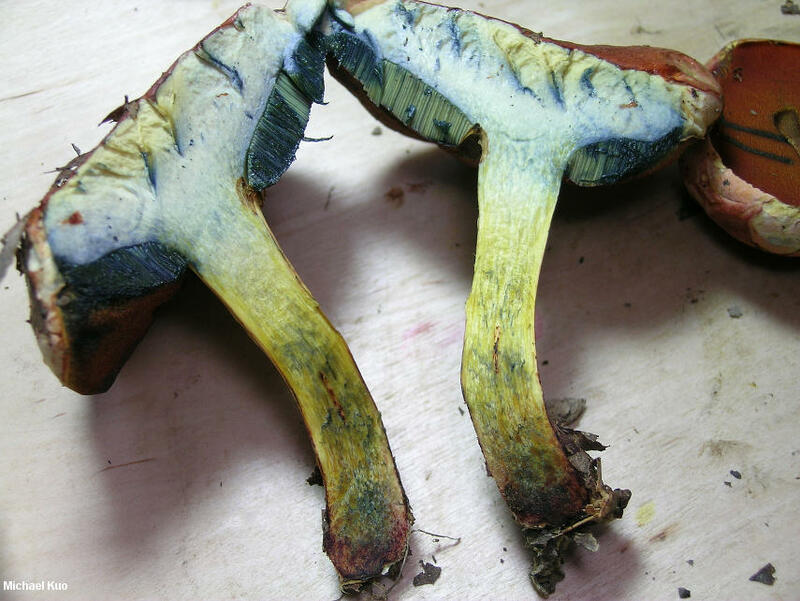 Stem: 3–9 cm long; 1–2 cm thick; more or less equal; not reticulate; yellow, decorated with fine red flecks and scales that are more densely packed towards the base; bright yellow at the apex; bruising blue; basal mycelium white, bruising dark purplish red. Flesh: Pale yellow in the cap; deep bright yellow to red in the stem; bluing when sliced. Odor and Taste: Odor not distinctive; taste slightly acidic, or not distinctive. Chemical Reactions: Ammonia negative to orangish or yellow on cap surface; negative (but erasing blue) to yellow or orangish on flesh. KOH negative to orange or dull, pale olive on cap surface; negative to orangish on flesh. Iron salts negative to grayish or dark gray on cap surface; negative to gray on flesh. 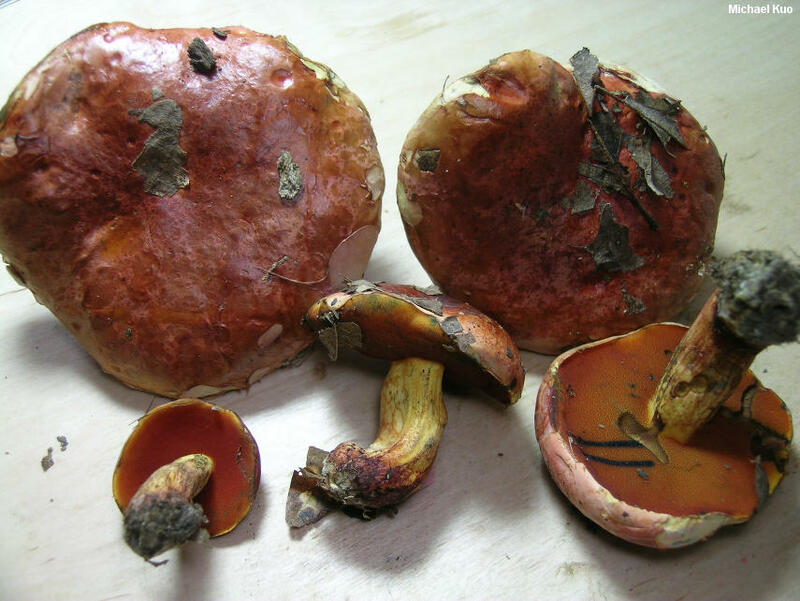 Dried Specimens: Caps retain the bright red shade for several years, but after about 10 years become dull brownish red. Spore Print: Dark olive brown. 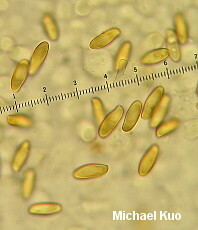 Microscopic Features: Spores 10–13 x 3–5 µm; smooth; subfusiform; yellow in KOH. Hymenial cystidia inconspicuous; hyaline in KOH; fusoid-ventricose to fusiform; to about 35 µ long. 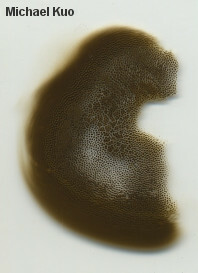 Pileipellis a cutis of hyphae 2–4 µm wide; golden yellow in KOH (but after about 10 years of preservation merely yellowish or nearly hyaline); terminal elements cylindric with rounded apices. REFERENCES: (Boudier, 1902) Kuan Zhao & Zhu L. Yang, 2014. (Saccardo, 1905; Breitenbach & Kränzlin, 1991; Ortiz-Santana et al., 2007; Both, Brown & Ortiz-Santana, 2009.) Herb. Kuo 09190303, 07060704, 06221001, 08281402.